By Galaxy, I was talking about Galaxy S and Galaxy Ace. From a couple of weeks of using the newly released Galaxy Ace, I may be able to offer a personal opinion based on my own experience. Short conclusion: Galaxy Ace is a toned-down, sluggish version of the power packed Galaxy S, and it's a bit sluggish for a much praised android clan. First up. Why choose Galaxy? That's simply due to the size, feel and functionality of the two galaxies in comparison to the iPhone (3GS). In fact, if you are to look at the galaxy from front - and perhaps from its side - there's little to differentiate the two makes. At least that's my first impression when window shopping the other day. Of course there are other touchscreen galaxy variants such as Fit and Mini but appearance-wise, the S and Ace fits my bills. If you look at the hands-on demo of the Galaxy Ace in my previous posting, you'd be forgiven to believe that this mini version of the power packed S is just as sleek and fast. Predictably it's a slight disappointment as I was hoping the android phone would not be to far behind the dated 3GS, although the money I spend on the Ace is substantially less. Newer gadgets should cost less at better specs and features, isn't it? 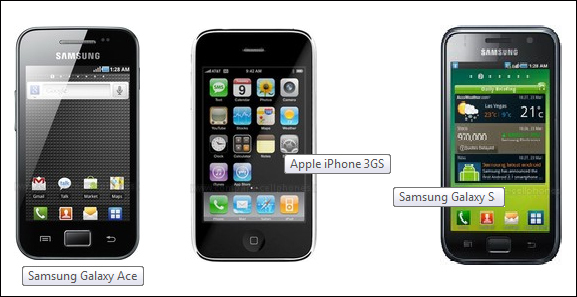 In fairness to Samsung, the 3GS should be pitted with Galaxy S considering price and features. Well I did not as I was prepared to lower the satisfaction bar for the Ace to begin with. But not too low as I later found out. So I read a little bit about what others say about the Ace and the 3GS. I beg to differ with their preference for the Ace. My opinion is that there's nothing that beats the feel of the iPhone. Solid, assuring and feel luxury befitting its cost. Both offer on screen QWERTY keypad that looks similar in arrangement and button size. With the iPhone, I can tap and type with accuracy. It's amazing how Apple fit in large thumbs and fingers to tap accurately on the small keys. With the Ace and S, texting with one hand is a pain, my goodness. The Ace's 800MHz processor is not any faster than the 600MHz installed in 3GS. On paper you might think it should but try browsing the Internet and you'll find there's no match. The 3GS is fast! In real life even the 1GHz Galaxy S struggle to match the surfing experience with the iPhone 3GS. Bluetooth connectivity with iPhone is a little bit tricky as it has pairing issue with other devices but with WiFi being easily available everywhere nowadays it is not a big problem for me. Other than the occasional fiddlings at Maxis centres, I have not get the chance to use the iPhone 4 for longer period but I don't intend to upgrade my 3GS just yet. The iPhone 5 is rumoured to be announced in the summer and I would seriously consider upgrading if it comes out that soon. As for Galaxy Ace, it's good enough if you are on the budget but want something elegant, trendy and something that fits sociable young professionals. It is retailed at RM999.00 but soon you'll be able to get a street price of RM950.00 to RM980.00, now that's not too bad. 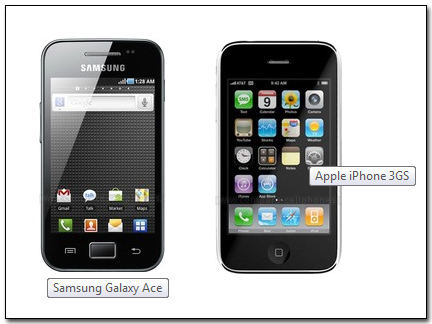 A good summary about the differences between the Galaxy Ace and Galaxy S can be found here. For the record, the S is priced much higher than the Ace (more than double). I am using the Ace as a second handset.